Cat Phones are known for their rugged nature and wide utility approach. They showcased their flagship Cat S60 smartphone at MWC 2016, bringing the first smartphone that was equipped with a thermal camera. It was recently launched in India for INR 64,999 and carries features that can put most rugged phones to shame in India. Cat S60 exceeds military level protection with 1.8 meter drop protection on concrete. It is dust proof, waterproof up to 5 meters and comes with a display that can be viewed in bright sunlight. The corning gorilla glass protection on the phone still makes it usable with wet fingers or gloves. 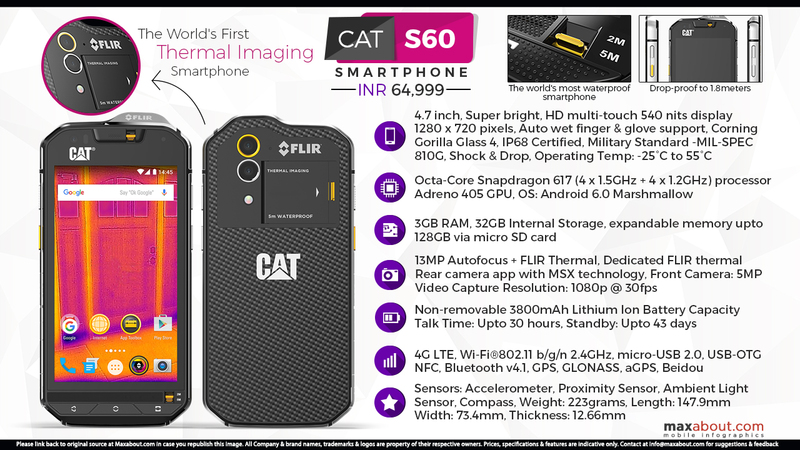 Cat S60 comes with 4.7 inch HD display, octa core Snapdragon 617 series processor, 3 GB of RAM and 32 GB internal storage. The underwater camera is 13 MP and comes with dual LED flash. It even comes with a 5 MP front camera. The FLIR thermal camera on the phone can be used to detect changes in temperatures of various objects, helpful when monitoring overheated wires and notice movement in totally dark conditions. The phone comes with a 3800 mAh battery and would be sold through Amazon India's website. The sale starts on 17th March 2017 while the phone is available in just Black shade. Click here to know more about the CAT S60.